With temperatures in the 70's here in Northern California, our weather looks more like spring than Christmas. That said, the theme of this month's Sparkles Christmas Challenge is "Old Fashioned Christmas" Pink and green are not what I think of for Christmas, but I think it does go well with this digital image. I stamped the sentiment onto the picture, did a bit of layering, added some ribbon and this card is finished. 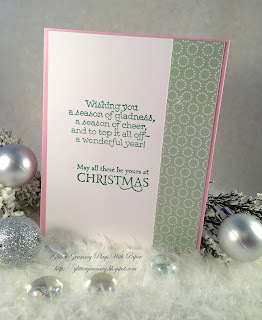 Check out the fabulous prize on the Sparkles Christmas Challenge blog. The Sparkles Christmas Challenge is easy to enter and the prizes never disappoint. For the ins and outs click on the link above. Couldn't get any easier than this. Hi Mary, What a pretty Christmas card. 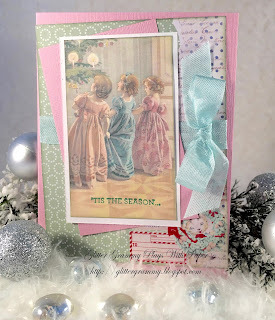 Hi Mary what a pretty card and the image is beautiful and your design is wonderful. Gorgeous card Mary, I love all the beautiful colours on your lovely image.